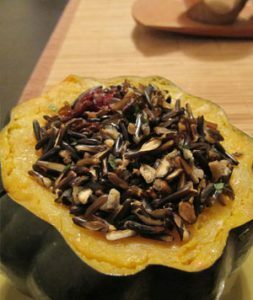 This stuffed squash recipe provides 40 percent of the recommended daily allowance for vitamin C and 15 percent of iron. What’s more, each serving is perfectly portioned inside half the acorn squash so you won’t be tempted to overeat the delicious filling. Preheat oven to 400 degrees. Scoop out membranes and squash seeds. Slice off rounded bottom of each squash half so that it is sturdy. Brush squash flesh with olive oil. Place squash cut side down into a baking pan, not a flat cookie sheet. Bake for about 30-40 minutes, until squash is slightly cooked through. Halfway through baking, add a little water to the pan so the squash doesn’t stick. Set aside until the stuffing mixture is prepared. Do not cook the squash all the way through, as the remainder of baking will be done after the stuffing has been added to the squash. Cook both rices according to their package instructions. While rice is cooking, prepare the dressing by whisking together the olive oil, wine vinegar, thyme. and garlic. Season with salt and pepper to taste. In a large bowl, mix the vinaigrette with the warm rices and toss to coat. Mix in the cranberries and pecans and evenly distribute. Using a spoon, fill the squash with the stuffing so that it is piled above the line of the squash. Place the squash back into the baking pan with stuffing side up. Cover with foil and bake for 20 more minutes, or until the squash is tender. Posted in Recipes. This entry was tagged diet, health, healthy, holiday health, nutrition, nuts, pecan, pecans, recipe, recipes. Bookmark the permalink.